It's the Roaring Twenties, and Evie is positutely ready to trade her boring hometown in Ohio for the exciting New York City, even though she is in a sort of exile after revealing the less savory side of the town golden boy through a special gift she has. When she arrives at her uncle's Museum of Folklore, Superstition, and the Occult, she's thrilled to be in a city of glamour and a swinging night life with her friend Mabel at her side and few new friends she meets along the way; but her uncle's profession ends up giving her more excitement than she bargained for. Soon she finds herself right in the middle of an investigation into a series of occult-based murders throughout the city. But when they get a bit too close to discovering the truth, Evie finds that she might be next. Libba Bray has delivered with this one. It's a great period book, and the way she infuses the supernatural aspects are riveting. It's historical fiction steeped in American folklore and magic, leading to a thrilling chase of a dead killer around the city. It's told in third person, so we see various points of view, including the murder victims', though the story mainly revolves around Evie and another guy named Memphis, who lives in the heart of Harlem and deals with a special gift of his own (and the consequences of having it). Every character has his or her own history, clearly well thought out on Bray's part, though not everything is revealed in this volume. I'm eager to learn more about everyone and their pasts. Bray dips into every part of New York City during Prohibition, into each group of people and many kinds of neighborhoods. We have African Americans in Harlem, immigrants in Hell's Kitchen, dancers who are stars, and pickpockets who are trying to just get by. The plot itself will drive you to keep turning the pages until you know how it all ends, and even by the time you get to the end of the book you know there will be more. This book certainly has its own story arc, but throughout there is a setup for big things to come. I'm really looking forward to where it might be going. Disclosure: Received from review via Netgalley in exchange for a fair review. Bray is so talented. Great book. Great review! Haven't heard of this, but I'm definitely going to look into picking it up! Great review. I really enjoyed this book! The ending is what kept me from loving it, but I'm definitely looking forward to the next one! I have to say, I thought there was a bit too much at the end; it felt like she wrote a few different endings and kept thinking it was the end and it wasn't. But that was a small nitpick for me. I haven't read Libba Bray before but I've heard good things about her. Not my normal genre, but it really does sound good. She is an incredibly talented writer, it's very much worth the read even if you don't normally read that genre. I loved this book as well. It is a huge book, but in my opinion, never felt like it was over 300 pages. It was awesome! 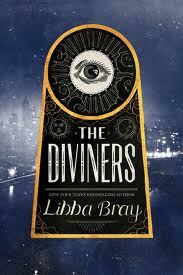 I have never read anything by Libba Bray before. I probably should. I have heard so many good things about her and her stories. I liked your review, and I am glad that you enjoyed this book so much. I wasn't sure if I was going to read this or not, but after reading your review I think I'm going to give it a try. I loved her other books, so it sounds like I'll enjoy this one as well. I'm intimidated by the sheer size of this book BUT it sounds amazing. I love that it's set in NY and in the 20s!